April is National Grilled Cheese Month and I continue to celebrate with a Spring themed asparagus pesto grilled cheese sandwich which I have guest posted on Wisconsin Cheese Talk. Asparagus pesto! That's a new one for me! I just checked out the recipe – fabulous! Asparagus pesto sounds incredible. Another winning sandwich recipe, Kevin :). That looks fantastic. The addition of the pine nuts is brilliant! What an idea. YUM!!! This looks to die for! I love the idea of asparagus pesto! That is my ideal grilled cheese. Looks amazing! 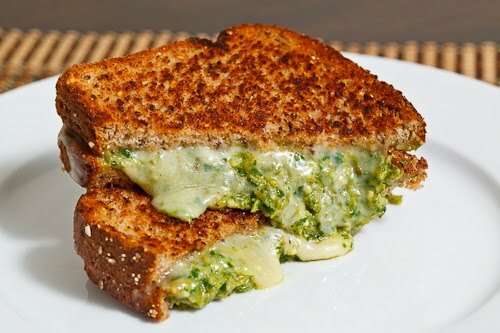 I love grilled cheese and I love pesto, so the idea of adding some asparagus to the mix sounds fantastic. I would LOVE to be making this soon! I love it when you make something I am competent enough to make. I just made this, and I added some lightly sauteed shallots. Holy yum! where do I get the recipe?